‘Old is Gold’ is an age-old proverb. Sometimes, the things which we term as useless or are not in use until a point, suddenly begin to seem so useful that their value appears to be no less than that of Gold. Currently the era of ‘Throwaway Living’ is prevalent all over. Despite this, the significance of the ‘Old is Gold’ proverb which derives from experience, remains untarnished. Based on the insight the proverb delivers, Sadguru Shree Aniruddha announced the ‘Juna Te Sona’ which is nothing but the Old is Gold Project in the year 2002. Aniruddha Bapu declared the ‘Thirteen Point Programme’ on 3rd of October, 2002. While announcing the ‘Vastra Yojana’ (a programme that provides for clothes), being one of these thirteen initiatives, he brought the concept of ‘Old is Gold’ to light. Through the project, he made the Shraddhavans aware of easy ways with which one may fulfil one’s responsibilities towards society. The social divide in our country is so broad that in several rural areas, villagers do not even have proper clothing to dress themselves or their children do not have toys nor do they have books. They do not have school books and other school material to seek education. Nevertheless, the ones who are privileged to have sufficient access to all of these, sometimes forget to value it. Many a time, we just throw away our old clothes; children’s old toys unnecessarily remain dumped at home or get sold off as scrap. The school books from the previous year too, suffer the same treatment once the semester is over. However, the commodities that no longer have any value for us or are as good as scrap can prove to be an equivalent of gold to those, who cannot afford to purchase them due to financial or social constraints. Thus, Bapu convinced us of the difference that our contribution of old books, toys and clothes could make through this programme. Subsequently, Sadguru Aniruddha Upasana Foundation initiated the ‘Old is Gold’ project under the guidance of Sadguru Bapu. Old clothes that Shraddhavans voluntarily give away are collected either at ‘Shree Harigurugram’ (New English School, Bandra) on Thursdays or at the ‘Sadguru Aniruddha Upasana Foundation’ Upasana Centres, which have been officially approved. 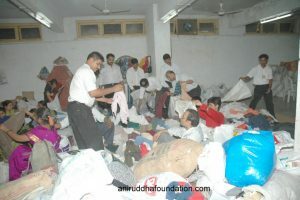 The volunteers from the organisation ensure the clothes are untorn and clean. Bapu has imbibed values into Shraddhavans such that the families in rural areas should receive the clothes which are in good condition. After the clothes are collected at the centres, they are segregated according to age groups. The categories include small children, middle-aged as also old, men and women. Thereafter, Shraddhavans visit the villages close to the wards in their locality and carry out surveys. A census of every impoverished family is conducted. An in-depth analysis of the number of women, men and children in each family is performed. It is followed by a review to check if the accumulated clothes match up to the requirement. In case the clothes are inadequate, the centres are requested to donate more clothes. The sorting begins once the numbers match and enough clothes are gathered for distribution. A bundle (in a cloth wrap), is made ready for each family such that every member receives clothes. Every family is either assigned a number with which they can be identified, or their bundle is tagged with the family name. It helps to recognise the family to which the bundle is to be given during distribution. All the bundles are tied together and loaded into a tempo or another vehicle and are transported to the previously surveyed villages. Once they reach the village at a central predestined location, the name or number of the family is called out, and a family member comes forth to accept their bundle of clothes from the Shraddhavans. The joy their faces emanate at that moment is priceless. They return home with great contentment. Albeit, the emotions uncovered by their faces has much to teach us. Apart from clothes, old utensils and toys are accepted too. The impoverished families are in extreme need of these utensils while their children in need of such toys. Over the past few years, the scope of the Old is Gold initiative has grown widely. Through the initiative, the organization distributes clothes, toys and utensils during their devotional service at Kolhapur Medical and Healthcare Camp (Link for Kolhapur Medical and Healthcare Camp). The medical camp is organized at Pendakhale village in Kolhapur. A few days before the camp, a group of Shraddhavans visit the place only to perform a survey and take an estimate of the requirements of every family with regards to clothing, utensils and toys. In accordance with each family and its needs, the bundles are then put together. On the day of the camp, the Shraddhavans distribute the essential garments, toys and utensils to these families. Param Pujya Nandai and Param Pujya Suchitdada personally visit the villages and distribute the material to the villagers. The joy visible on the faces of the villagers here is indescribable. 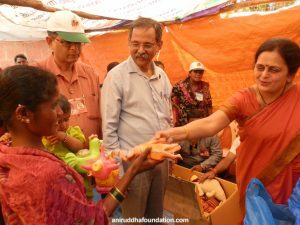 The ‘Old is Gold’ project of Shree Aniruddha Upasana Foundation which began due to the inspiration of Sadguru Shree Aniruddha Bapu, has served its purpose for several families through the provision of clothes and other essentials. These families have begun to live under the refuge of Bapu’s unconditional love with happiness. And what is perhaps most remarkable is that innumerable old materials of Shraddhavans were treasured as gold itself.